This wasn’t easy- trying to whittle it down to just ten? I put a constraint on it; they all have to be 2015 releases, or gawd I would have been here through New Year trying to decide. This book stayed with me in a strange way. It has a compelling concept, and I really loved the opening. It was the overall tone and drive of this book, however, that makes me love it so much. I feel like I was secretly waiting for this book to happen, and when it did, I could have cried with joy. I owe so much to the Study series, and to see it continued is an absolute dream. Yelena and Valek are on top form, and there is still such an intelligent balance between action and romance and mystery. 2015 was also the year I got to go to MIRAInk and meet the author too. Uh-may-zing. Wow. This series is just wow. I went crazy for the first book… so imagine my joy when I find out I’m in the ‘praise for Reckoning’ section in this book! It’s a really great feeling. But this series dudes, just when you thought dystopian YA was falling a little by the way side, Kerry Wilkinson is like BAM have this. And it is marvellous. I actually picked this book up from the library on a whim. The cover was super cool and I loved the concept. This book is pure reading addiction- you know those books that are just so easy to fall into and so so hard to put down? Yeah, this is one of those. It’s like The Godfather/Gossip Girl mash up and I am all over it like a rash. Oh! And so chuffed to have won a signed fist chapter of book two, Inferno, at YALC back in July. This book is another ‘wow’ book. It’s all in the narrative style. A lyrical, magical prose that pulled me in and refused to let me go. A slightly odd story, when you think about it, but I didn’t think about it too much, I was happily caught up in it. Sublime. I would recommend this book to ANYONE AND EVERYONE. Oh lawdy, if you’ve spotted me around the blogosphere you’ll know that every chance I get I will wang on about this book. Why? Because it’s just so darn unique and such a great read, I want more people to experience it! An absolute masterpiece… I wish I had written it! I got my book signed by the author at YALC too! Winning! I am obsessed with this series, to the point that I now can’t listen to Alt-J without thinking about it in some way. Air is the second book, and it’s really interesting to see how the characters change and react in a different setting. It’s got great pace, but most importantly, great characters that I want to cling on to. And let’s face it, there’s surfing. Yes. So much yes. For me, this was filling the ‘fluff’ hole (huh, that ain’t a great choice of words..) that keeps opening up ever since I finished Stephanie Perkins’ Anna series. Every so often I have to go in search of something light and yummy like whipped cream. This book did all that and more. I was surprised how deeply invested I was with the characters and the story. Beautiful setting, wonderful characters development and interactions. The little book is a powerhouse. It’s creepy and chilling, and so compelling. I was entranced by it, totally. some of the scenes are so dark and quite daring and I LOVED that. It was the perfect read for the Halloween season, but I’m into this kind of thing so I would have loved it any time of the year. This book. You guys, this book. It’s just… amazing. I have not felt so strongly about a series in a very long time, but the Red Rising books are something special. The attention to detail, the deeply complex characters and plot, the way everything just clicks together all of a sudden and I’m left mouth open, catching flies. It’s a stunning piece of writing. And this second book has such a WHOPPER of an ending. Floored me. 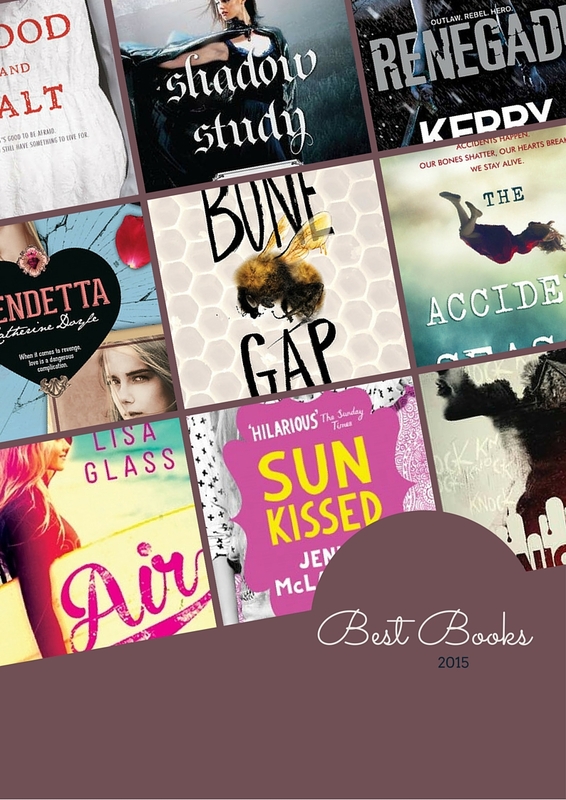 What was your TOP book of 2015? Did any of these make it onto your lists? Let me know! And link me to your TTT! It’s so interesting to look at everyone’s lists! I haven’t even heard of most of these and I haven’t read any of them yet. I just won a review copy of Red Rising from Goodreads, so I’m planning to read that one eventually. I own Poison Study and I really want to start that series in 2016 too because I’ve heard great things! So many on that list that I wanted to get to. Daughters unto Devils was one I’m particularly sad I didn’t get to. I hadn’t heard of Sunkissed before, but I do love a light fluffy book so I will have to check it out. Can’t wait to read The Bone Gap! You seem so enthusiastic about The Bone Gap! I’ve heard so many good things about it, hopefully I can read it soon 😀 My TTT. Bone Gap was on my list this week as well! one of my FAVORITES and my friend actually just sent me a copy of Bone Gap that she got signed for me!! great TTT post this week! Thanks! I hope you enjoy Bone Gap! I ADORE Maria V. Snyder and can’t wait for Night Shade!! !